Last Thursday night Zambia time the election results were announced after over 48 hours of waiting. The winner was Michael Sata, and for the first time in Zambia's history a member of the Patriotic Front party has won. We aren't really sure about what the dude next to him is wearing on his head but we will just ignore that! We are beyond grateful for the way this election was handled. There was little rioting and violence. When Sata won, Banda stepped down from his office in a peaceful way and encouraged his supporters to do the same. We are so happy that Zambia was able to conduct themselves in a manner that is admirable. 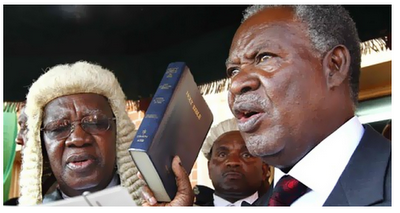 We honestly are not sure of how Sata will lead Zambia. We are encouraged by his platform which says that stopping corruption will be a major part of his work. Sata also seems to understand that allowing foreign countries to come in to Zambia and own all the businesses and get all the governmental contracts makes Zambia a poorer country. Currently China runs all the major money making copper mines in the copperbelt region of Zambia. They treat their workers terribly and the Zambians working for them essentially are slaves to the mines. China also was able to get the contracts to fix the roads in Zambia which was through the government. They rarely hire Zambian workers and when they do, they do not pay them what is adequate. In fact, it is rumored that China gave the previous president Banda, over 50 million dollars to help him in his elections. That is ALOT of cash in Zambia folks! Sata has a vision for better education and more jobs for his country. We ask you to continue to pray for this transition time. We also pray that Sata remains true to his word and that he can stand above bribes or anything else that might come to him. We pray Sata is able to help Zambia and not hurt them. We are hopeful!